With Christmas just under a week away, it’s time to start planning your holiday dinner, if you haven’t already! The holiday season can be a stressful time with lots of yummy food temptations, and it can feel almost impossible to stick to your healthy eating plan. However, with a little planning, you can survive the holidays while eating healthy, without depriving yourself. Here are seven tips on surviving the holidays while eating healthy. #1 Don’t Deprive Yourself: The biggest tip is not to deprive yourself! While you don’t want to go overboard, completely depriving yourself of your favorite holiday recipes isn’t always the best idea. Instead of feeling like you can’t eat any of your classic holiday recipes, try picking one and reducing your portion size. Maybe have a third of what you would normally eat, and then fill the rest of your plate up with healthier options. Allowing yourself to have a small portion of your favorite recipe will make things seem much more doable when it comes to Christmas dinner. #2 Bring an Appetizer or Dessert: If you are going to a holiday party, offer to bring an appetizer or dessert. Appetizers and desserts are usually the hardest part of a holiday dinner party as there’s room for all sorts of unhealthy options. However, if you bring a healthy dish, you can be sure there’s something there for you to eat. #3 Make Healthier Swaps: Just because you’re choosing to eat healthy, doesn’t mean you can’t enjoy a Christmas cookie...or two! Making healthier swaps by replacing sugar with raw honey or pure maple syrup in your baking recipes to make enjoying them just a tad bit healthier. #4 Replace Dairy with Dairy-Free Options: Try replacing the dairy in your holiday recipes with a dairy-free option like coconut or almond milk. #5 Skip the Bread: If you are used to having bread at the Christmas dinner table, try skipping the bread this year and saving room for healthier options like roasted vegetables. #6 Don’t go Shopping Hungry: Catching up on late minute holiday shopping? Don’t go shopping hungry! You will be much more likely to give into that Starbucks temptation if you are out and about without having had breakfast or lunch yet. #7 Make it a Goal to Keep Exercising: Don’t let the holidays be a reason to let your healthy lifestyle take a backseat. Keep up with your exercise routine as best as you can, and you will be in a much better spot entering into the new year, feeling strong and healthy. 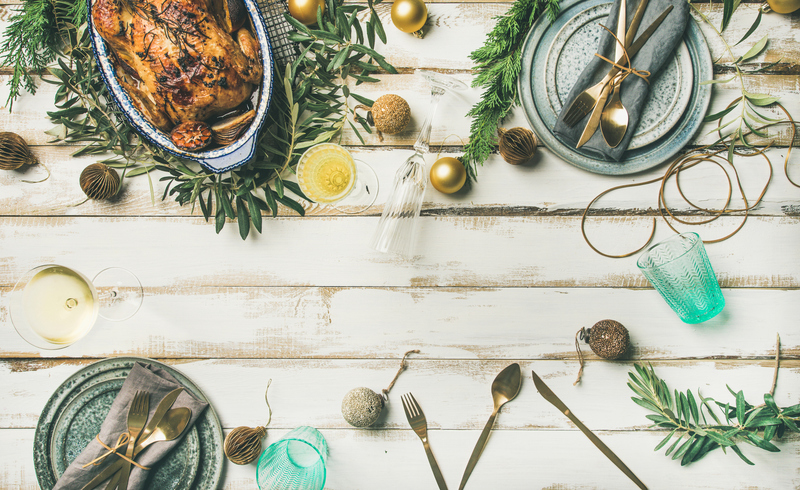 It truly is the greatest time of the year, but the holiday season also often comes with stress and anxiety surrounding food choices. Don’t let the holidays get in the way of your healthy eating. Try implementing these seven tips to make the holidays just a little less stressful and that much more enjoyable. Bonus tip: Want to support your body during this time of year? Supplementing with an adaptogenic formula blend like Yinergy or Vigor can help balance your hormones, support the adrenals, and help you feel your best as we enter into the New Year.